I must admit, I hadn’t heard of Ventile material before, but I am now so thankful that I have. 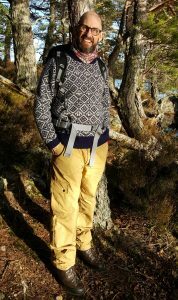 Thanks to ‘ Hilltrek Outdoor Clothing ‘,I got to try out their Ventile Blaven trousers and was delighted with what I found. I put them right to the test by going out into the snow and I was not disappointed. Ventile material is a natural fabric made out of cotton. It is highly durable and it is ideal for outdoor pursuits. Made from cotton fibers it is comfortable, heard wearing and protects you from the elements. Once the fibers are wet, they swell and provide a barrier to any further water. This makes them weather and wind proof providing comfort and warmth while staying completely breathable at the same time. These trousers are all hand made to the highest standard. The have two pockets front and back, as well as two cargo pockets on each side. The rear pockets fasten securely with a zip and the cargo pockets with poppers. I have to put my hands in the air now and say that I am a convert. The first time I wore them I really put them to the test by going out on a cold winters day in the snow. I must say I was really impressed with them. I was very warm and comfortable. The bottom of the trousers of course got wet with snow but I didn’t even notice. They formed a fantastic barrier keeping me warm and dry. I am very grateful to have discovered these trousers and I look forward to using them again in the near future.